The Long Weekend is a workshop oriented convening of creative professionals hosted in the rural Cuyama Valley at the Blue Sky Center. This two day gathering features unique hands-on workshops and peer-to-peer skills exchange ranging from welding, arts, and culinary arts. This intimate convening will feature opportunities to connect with creative professionals working across various disciplines in different communities across the country. Dinner chats will feature discussions led by our honararia guests followed by short films and entertainment. UPDATE: we're fully sold out and booked for the long weekend! Bounded between the spectacular Caliente and Sierra Madre mountain ranges, the Cuyama Valley is a two-hundred square mile high-desert valley and hidden gem of California. Located near the Carrizo Plain National Monument and surrounded by National Forest, the Cuyama Valley is a farming and ranching community steeped in a pioneering, can-do, and spirit. The community is rich and diverse with residents from many walks of life and origins. It is small and proud. Tightly woven and hard-working. Expansive in both space and possibility. Located just two hours from northern Los Angeles and one hour from the Central Valley and Central Coast, the Cuyama Valley is a world away and a unique place in it's charm and character. We welcome you to experience and enjoy our community during the Long Weekend. Blue Sky Center encompasses repurposed mid-century infrastructure built by Atlantic Richfield Oil Co in 1950 and adjoining agricultural land. 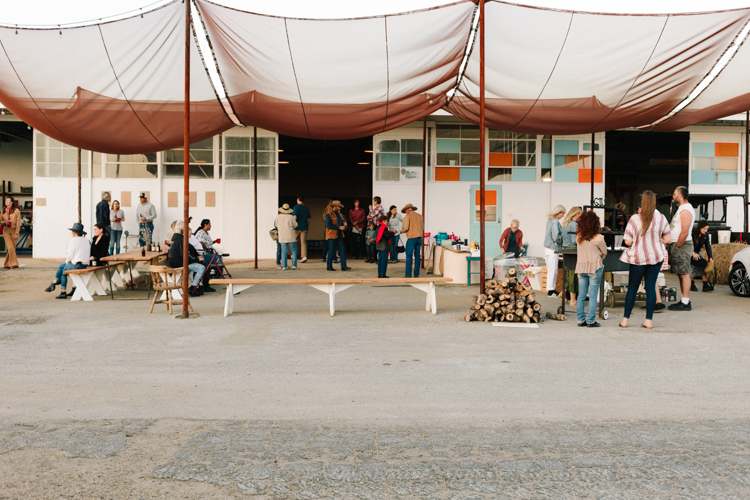 The campus contains over 22,000 SF of buildings and space which have been adaptively repurposed to serve as a resource for the Cuyama Valley and destination for outside aligned groups and programs. The Center currently supports small business development, facilitates creative programing in areas of food, arts, and design, hosts events, and generates and shares reports and studies supporting equitable rural community development. The campus is now home to offices, workshops, studios, kitchen and bar, theatre, and tourism venture. Jack received his master of architecture degree from The University of Texas at Austin and his bachelor of architecture degree from Auburn University. His senior thesis, The Newbern Baseball Club, represented the Rural Studio at the 2002 Whitney Biennial in New York. Jack’s work at the Rural Studio has been exhibited worldwide and is featured in the books, “Rural Studio: Samuel Mockbee and an Architecture of Decency” and “Proceed and Be Bold: The Rural Studio After Mockbee” — both published by the Princeton Architectural Press. Jack is the founder and principle of DesignBuildAdventure based in Austin, TX. Haven Lin-Kirk is an artist and designer researching + producing art + design that explores design as a cultural language. Haven earned an MFA at Claremont Graduate University and has had exhibitions at The Brewery Project, Bank Gallery and POST Gallery in Los Angeles; Ruth Buchofner Gallery in Santa Monica; and Otak Gallery in Dubrovnik, Croatia. Lin-Kirk has received a Maggie Award for Best Overall Design. She is also Vice President of Education, AIGA Los Angeles Education Committee. She is the Vice Dean of Design at the USC’s Roski School of Art and Design. As part of the Long Weekend participants will enroll in day long workshops in welding and culinary arts. Workshops will be led by honoraria guests and will have limited capacity. Attendees who register will be assigned to workshops at checkin-in as space is available with first and second choice. Friday, June 15 will begin with Shibori indigo dying and screen printing activities at 4:00 PM followed by happy hour where participants will be introduced to workshop leaders. The day will end with a community dinner and entertainment. Saturday, June 16 will begin with coffee and breakfast followed by group yoga or a walkabout. Workshop groups will break out for a session followed by lunch. After lunch groups will finish their projects which will lead into a farm to table dinner, entertainment, and fire-side chats. Check in at the Flagship Building beginning at 2:00 PM with a volunteer. Receive a nametag or bring your own. You’ll be assigned a number and color via BINGO! Hang on to your nametag as it will be used throughout the weekend. We have two workshops, ongoing activities, and one roundtable discussion. Participants will have the option of signing up for one workshop or deciding to partake in ongoing activities. Sign up for workshops is first come first serve at check-in on Friday June 15 from 2:00 PM - 4:00 PM. Once they fill up you will have your second choice. Join Haven Lin Kirk in an opening Shibori indigo dying activity. Haven will give a brief introduction to Shibori and provide a hands-on demonstration. Choose from some garments to dye or bring something of your own to dye. Shibori will also be available on Saturday. Join José Luis Cardoso and Garrett Gerstenberger from High Desert Print Co to print your own Bandana or T-Shirt. Event merch features original designs from the USC Roski School School of Art & Design. Join the Blue Sky team in the Khalili Cantina, on the BSC campus, for appetizers + drinks. Learn more about the Blue Sky Center history, mission, vision, and projects with an introduction from the team. Meet the workshop leaders and learn about the Saturday activities. Kyle Thompson, co-founder and owner of Topa Topa Brew Co will be on hand to talk about their beer and values as a 1% For the Planet company. All weekend long we will be using a BINGO board to spur conversation, interaction, and gain feedback from you. Happy Hour will feature rapid fire, speed date-style interactions so everyone gets a chance to talk to one another. Local small business El Mejor de Acapulco will be popping up to serve tacos, rice, and beans. Come out and learn the basic constellations with our very own Jack Forinash. Moon will only be 11% lit so we expect dark skies and plenty of constellations in view. BONUS: Come prepared with your astrological sun sign and rising sign. Jack is our in house amateur astrologist. Our own Em Johnson, Chief Operations Officer for Blue Sky Center will be hosting a morning yoga session prior to workshops. Prior to joining Blue Sky Center, Em spent two years in India working for a women's educational and empowerment non-profit organization and practicing and teaching yoga. Beyond her role as Blue Sky she continues to travel to teach yoga and remain dedicated to her practice. Join Tehachapi Grain Project to walk Blue Sky’s open agricultural land and discuss soil health, heritage grain, and local food. This discussion will lead directly into the grain and culinary workshop. Local business, Big Boy BBQ, will be serving up beef tri-tip, chicken, beans, vegetables, salad, and bread. Come learn and participate in this roundtable discussion organized by Larry & Elijah Santoyo of the Permaculture Academy around design thinking and problem solving in communities. Explore the identity of place, roles and responsibilities, and themes around social enagment through design. Return to the Cantina to share workshop experiences and network and projects. Welding groups have the option of presenting their projects at whatever stage: conceptual, finished, or unfinished. Join renowned Chef Clark Staub for a farm-to-table dinner featuring locally and regionally sourced ingredients. Flatbreads were made during the workshop from regenerative, heritage grains grown by Tehachapi Grain Project. There will be a short discussion by Tehachapi Grain Project and other farmers about the importance of regenerative farming, local grain, and food systems.